Automotive engineering is a branch of vehicle engineering. The study of this course incorporates the aspects of mechanical, electrical, electronic, software and safety engineering as applied to the design, manufacture and operation of different types of vehicles like motorcycles, automobiles and trucks and their respective engineering subsystems. This branch of engineering is specially meant for those who have a passion for motorcycles and cars. Passionate students can take up this study at both graduate and postgraduate level. Students taking up this course will get to learn about the application of mechanical, thermodynamic, pneumatic, hydraulic and electrical principles with an aim to determine engineering problems. This course also includes the study on modification of vehicles. The manufacturing domain deals with the creation and accumulating the whole parts of automobiles giving their actual shape. 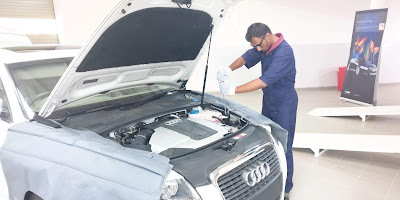 In India, there are many reputed automobile engineering colleges, which provide number of automotive engineering degree programmes from among which aspirants can make a choice according to their interest. During the study of the automotive degree programmes, students will learn how to design and produce visual analysis of the automobiles and their components. The students would be taught to develop the test procedures. They will learn to conduct tests by using physical testing methods and software packages. Another fascinating aspect of the course is that students would also get a chance to supervise and inspect the installation, modification, and commissioning of mechanical systems at the industrial facilities or plants. This field of engineering is research demanding and engrosses direct application of mathematical models and formulas. The study of automotive engineering mainly includes design, develop, fabricate, and testing vehicles or vehicle components from the concept stage to production stage. In this field, production, development, and manufacturing are the three major functions. For UG programmes: Students who have cleared their 10+2 from science stream, with subjects Physics, Chemistry and Mathematics are eligible to take up the entrance examination held for securing admission seats in the reputed automotive colleges for the course. For PG programmes: The postgraduate automotive programmes are open to students who have passed graduation examination in automotive engineering/Bachelor in Technology in Automotive from any recognised university. If you are looking forward to become an automotive engineer then you can opt for any of the following automotive engineering degree programs after your 12th standard. In this Bachelor’s degree programme, students will learn the utilization of automation engineering in new areas of application. They will also get to know about how efficient and inexpensive new data technology devices in particular can offer many interesting opportunities for automation technology. This course focuses on imparting knowledge on vehicle theory, vehicle design and experimental technique through advanced applied talents of engineering technology and management. This helps the students to engage in work of design and development of vehicle and vehicle parts, experimental research and management in department like vehicle design and manufacture, research and development and management and maintenance. If you are in search of the best college to pursue your dream of becoming an automotive engineer then Rustomjee Academy for Global Careers (RAGC) in Mumbai would be your best choice. It is one of the leading automotive academy offering various degree programmes for the aspiring engineers in the field of automobiles.